Download YouTube HD/SD videos (MP4, FLV, and Webm), download YouTube 3D videos, YouTube 1080p and 4k HD videos. Convert YouTube videos to MP3, AVI, MKV, WMV, 3GP, etc. Convert YouTube MP4 to MP3. Convert YouTube videos to play on iPod, iPhone, iPad, Kindle Fire, Nexus, Surface Pro, HTC One or other phones. Convert local video files with different formats to other video formats. Directly transfer MP4, MOV, and MP3 file to iTunes. This YouTube Video Converter works well with the latest YouTube upgrade! 4Media YouTube Video Converter helps you to easily download and convert YouTube videos (even 1080p HD and 4k videos, 3D videos) to MP3, AVI, MPEG, WMV, etc. With it, you can watch YouTube videos on your iPod, iPhone, ipad, Samsung Galaxy, Kindle Fire, Nexus, Surface Pro, HTC One, Nokia Lumia and other popular media devices offline! Moreover, it can be a powerful Video Converter to convert all popular videos like AVI, MPEG, MP4, MOV, H.264/MPEG-4, RM, MPEG-4, DivX, XviD, etc. 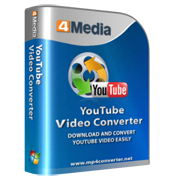 4Media YouTube Video Converter provides several preferred settings. So you can download and convert videos easily. Download YouTube videos, even download 3D videos and convert them to various video formats like AVI, MPEG, MP4, 3GP, DivX, XviD, etc. Directly download all YouTube HD videos, including 720p, 1080p and 4k videos. It can be a convenient and practical video converter to convert your local video files like AVI, MPEG, WMV, MKV, MP4, H.264/MPEG-4, RM, MKV, WMV HD, etc to any other videos. Convert YouTube and local videos to various videos that are playable on iPod, iPhone, ipad, Samsung Galaxy, Kindle Fire, Nexus, Surface Pro, HTC One, Nokia Lumia, Blackberry and among others. Set Output for Various Multimedia Devices You can set your output file just for specified devices like iPhone, iPad, Galaxy, HTC One, Moto X, Nexus, Kindle, Surface, Lumia, etc. More Options to Better Assist Your YouTube Video Conversion Set preferred video quality, resolutions, video bitrate, and formats; Set max simultaneous downloads and conversions; Set custom download and conversion settings. Choose the option "Automatically Convert" to let this YouTube Downloader directly convert the videos after downloading. Automatically Transfer MP4, MOV, and MP3 file to iTunes This YouTube converter provides the option for you to choose if you want to automatically transfer MP4, MOV and MP3 file to iTunes after downloading and converting. Multithread and Batch Download With multithread technology, downloading and converting is faster than ever. You could download and convert YouTube videos in batches to save time and effort. Auto Software Update Update your YouTube Video Converter software version automatically when connected to the internet. Multiple Languages 4Media YouTube Video Converter offers multiple interface languages, including: English, German, Spanish, Japanese, French and Chinese. Add the function of converting automatically after downloading. New and much smarter design brings much easier usage and better user experiences. More powerful conversion functions let you convert all videos in different formats to any other videos. 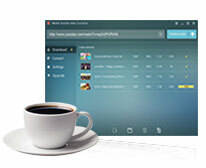 Users can customize YouTube video quality and output formats. Support downloading YouTube HD videos. 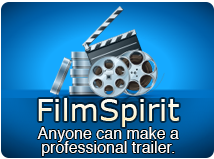 Support downloading all YouTube videos including FLV, MP4, and Webm. Support converting to all videos compatible with almost all devices and players. Support converting to more kinds of video and audio formats. Users can customize the conversion settings. Support directly transferring MP4, MOV, MP3 files to iTunes.